Foreword by Dr. Michele Borba, Today show parenting contributor, recipient of the National Educator Award, author of The Big Book of Parenting Solutions and Don't Give Me That Attitude! Why Hang Out With Kids Who Make You Feel Inferior? Tyler's neighbor Jake brags about everything. Tyler can't show Jake a basketball move, a school assignment, or a new toy without Jake saying he can do better—and it leaves Tyler feeling like he shouldn't even try. With help from his uncle Kevin, Tyler begins to understand that Jake's bragging has nothing to do with Tyler's own abilities and more to do with Jake. 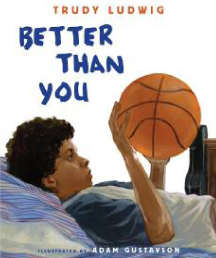 Better Than You helps give kids insight into what lies beneath the urge to brag and shows them how bragging can break friendships rather than build them. This wonderful resource also includes an author's note, discussion questions, and additional resources to help parents, teachers, and counselors generate thoughtful conversations about real friendship issues kids face in their everyday world.